NC rejected Obama in the 2012 presidential election. What you probably did not hear was that Rouzer is the first Republican to win that seat since 1868. From the Wilmington Star News November 4, 2014. David Rouzer has been elected the first Republican in generations to represent Southeastern North Carolina in the U.S. House of Representatives. Rouzer, a repeat Republican candidate for North Carolina’s 7th Congressional District, was declared winner by the Associated Press at 9 p.m. Meanwhile, Republican U.S. Rep. Walter Jones easily held onto his 3rd Congressional District seat. Rouzer said Tuesday night he was humbled by the support he received from 7th District voters. “This election is not about me, it’s about doing what’s right for America,” Rouzer said in an interview. As a congressman, Rouzer said he will support a strong national defense, energy development and getting burdensome federal regulations out of the way. When Mike McIntyre announced earlier this year he was retiring from Congress, it guaranteed a new face for the seat he has held for 18 years. Three men in their 40s, Rouzer, Democrat Jonathan Barfield Jr. and Libertarian J. Wesley Casteen, faced off in the race. I was preparing an article on the impact of Obamacare on consumer spending. Before beginning to write the article, the material expanded so much as to require a multi part series. So many lies, so little time to expose. Living in NC, and as sick of the non stop political ads as anyone, I still find my jaw dropping every time I hear the Hagan ad accuse Tillis of Medicare cuts. Kay Hagan helped Obama pass Obamacare. 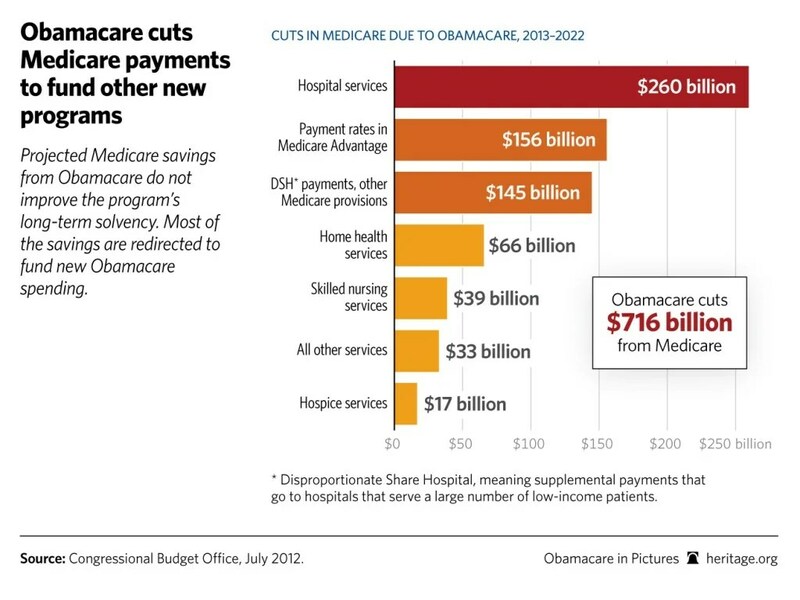 Money that had previously gone to Medicare Advantage Plans has been redirected to Obamacare. From the Daily Caller February 2, 2014. “One of the most troubling aspects of President Obama’s takeover of health care is the more than $200 billion in cuts that Obamacare is taking from the Medicare Advantage (MA) program – a program that over 15 million seniors and individuals with disabilities have chosen to enroll in across the United States. As of January 2014, Ohio had over 763,797 enrollees in the MA program and roughly 38,766 of those enrollees reside in Eastern and Southeastern Ohio. This administration must stop these cuts to the MA program from happening if they want to protect the well-being of seniors across the country. Last year, Medicare Advantage beneficiaries learned of a 6.7 percent rate cut that would hit their health care plans in 2014. These cuts are already being felt by seniors as access to doctors becomes more limited, and out-of-pocket payments increase. I recently experienced firsthand what these cuts mean for those living in Ohio when a number of local physicians had their practices dropped from participation in MA plans, forcing seniors to switch plans or leave their long-term physicians. From the Herald Sun September 26, 2014. “Blue Cross and Blue Shield of North Carolina will drop its Blue Medicare HMO standard and Blue Medicare HMO Enhanced plan products in 11 North Carolina counties in 2015, affecting 50,000 beneficiaries statewide. The counties include: Alamance, Davidson, Forsyth, Iredell, Rowan, Stokes, Surry, Wake, Wilkes and Yadkin, which makes up about one-third of BCBSNC’s Medicare Advantage population, said Michelle Douglas, public relations manager for BCBSNC. Under HMO plans, beneficiaries generally must get care from within the plan’s network as opposed to PPO plans, which contracts with a network of preferred providers to which the beneficiary can choose. Mary Snider, a BCBSNC customer who lives in Davidson County, said she received a letter this week that said her Blue Medicare HMO enhanced coverage would no longer be available. According to the letter, if Snider does not take action before Dec. 31 on selecting a new plan, she will lose prescription drug coverage and only have Original Medicare beginning Jan. 1. Snider said her monthly premium for Blue Medicare HMO Enhanced was $18.90 per month, which is confirmed by Centers for Medicare and Medicaid Services (CMS) data. The BCBSNC letter does not outline the new plan offerings or specifics because they are not made public until Oct. 1. However, according to CMS data that shows approved plan premiums for 2015, the only available HMO plan with drug coverage from BCBSNC in Davidson County is set to increase by just over three times Snider’s current premium, to $63.50 per month.